“The Doctor has decided to keep the Gremlin as a pet. He says he is going to train it”. “This has caused a great deal of contention within the Doctor’s big nest. The female human that lives with him does not like it. She does not like it at all. “What if it gets loose”? she asked a bit perturbed. “It won’t”, replided the Doctor nonchalantly. “Is it a male or female”? She continued. “How should I know. What does it matter anyway”? replied the Doctor, now undeniably annoyed by the continued inquest. “Calm down”, said the doctor. “I have everything under control”. “Everything under control”, means one thing to the Doctor, but quite another to the human female that lives with him; one of many examples: The time he decided to fix dinner for her on her birthday. “Do you need any help”? She asked, from the living room, while watching George Stephanopoulas on the 6:30 News. “No thanks honey, don’t worry, I have everything under control”. The brand new gas grill was destroyed and it took six weeks for the Doctor’s burn to heal. The female human that lives with him dropped the subject abruptly. Silence prevailed. She did not even congratulate Cleo on her great catch. “Don’t worry”! The Doctor exclaimed again. I have a custom made titanium cage, imported from Deutschland, Germany. I have been saving it for just this sort of occasion. 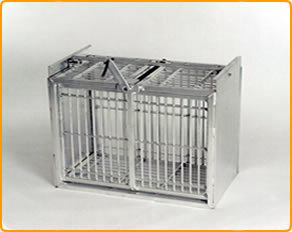 This cage is made of 90% titanium and is 10% cobalt alloy. It is specifically designed to contain Gremlins, Imps, Hobgoblins, Pixies, Brownies and other miscellaneous mischievious elves. There is no need for proton packs, unlicensed nuclear accelerators, neutrino wands or hard-hitting boson darts, although we thank Dr. Spengler for his ground breaking advances in containing mythical entities. The pad lock is made of Zirconium oxide. “The domesticated wolves are unhappy too, especially Marley. The Gremlin can send messages to Marley, but it’s a one way street. It can send messages into Marley’s brain, but Marley cannot respond. Marley hates the Gremlin and spends most of the day barking at it. The Doctor and the Gremlin cannot communicate at all. Nothing seems to work; telepathy, body language, sign language, eye contact nor facial expressions. “I can easily recieve Marley’s telepathy, but Marley does not know it. Marley spends hours trying to ward off the Gremlin’s messages; he tries to block them out to the best of his ability. I am worried about Marley’s mental health. ‘I am sorry to say, this Gremlin is going to be a bad actor”. 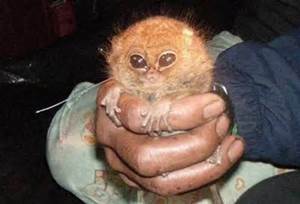 it looks like a Lemur?! What is it?? I don’t know what the hell it is. We caught it in the marsh just 4 or 5 five feet from the buried cable. It must be the gremlin. I have had no problems with my equipment since I caught it. Gremlins in a titanium cage. I like it! I’m going to keep it in my office right next to Angela.